Marketing is changing, and the speed of change is pretty mind-blowing. It was only 10 years ago that Rightmove listed less than 10% of properties for sale, YouTube was just a baby, and Mark Zuckerberg was trying to launch his new idea: The Face Book. Fast forward to today and who could have predicted the rise in social media, pay-per-click and live streaming? Did you know when you first launched your agency that being a marketer would one day be more important than selling houses? In the thirteen years I’ve been working with independent agents to help them build their businesses, it’s been quite a challenge to keep up with every change, innovation and new idea, but it hasn’t stopped me trying. I’m a self-confessed obsessive about marketing. I live and breathe it, and share the very best of the very best ideas with my wonderful clients. You see, I believe that independent agents need a secret weapon against the corporates and the onlines, and I could just be yours. If you’d like to have a chat to discuss if and how I may be able to help you really boost your business in 2017, just tell me a bit about you and your business here. Prediction #1: Agents will more closely measure ROI on their marketing activities. Where agents used to claim ‘brand awareness’ as their goal in many marketing campaigns, they are beginning to realise that return on investment is only measurable in marketing that incites a response. Whether this response is an opt-in to an email list, or attendance at an event, the agent can attach a value to the response and so be in a position to determine if the campaign has been a success or not. Example: driving paid (Facebook) traffic to a ValPal (instant online valuation) page then tracking these leads to see how many convert to phone conversations, market appraisals, instructions and sales. Prediction #2: Agents will shift from ‘mobile responsiveness’ to creating an engagement strategy for their customers on mobile. Though most agents now have a website that is mobile responsive, 2017 will see agents create new strategies to help them better communicate with prospects and clients through mobile. SMS marketing messages have huge potential; click-through rates are close to one in three, as opposed to email, which is usually less than one in twenty. Offering a valuable incentive for signing up to an email list, publicising an event and sending reminders by text for viewings and other appointments are all mobile-focused tactics that will help the agent reach their clients and potential clients more directly. Example: using LeadDigits, the SMS version of LeadPages, to capture leads via SMS messages. This has a much higher opt-in rate than taking mobile users to a landing page, no matter how well optimised. We know that people buy people, and that is especially true of the estate agency industry, where trust and confidence are the key factors in making a decision on which agent to instruct. Agents will accept the fact that trust in big brands is eroding, and the small independent agents can take advantage of this by using their personalities to promote their independent status. Social profile photos will show the person, not the brand, and updates will become more personal and interesting, moving away from industry facts and figures, and towards more ‘behind the scenes’ and community-focused content. Example: Matt Giggs uses his Giggs and Co Facebook page to show team spirit, have fun with photos, share inspirational quotes and generally create the impression that his company is warm-hearted, personable and dedicated to customer service and excellence. With margins tight and competition driving down fees, agents are starting to realise the benefit of systemising and automating their marketing activities. Creating a marketing funnel with every step automated means that leads are generated by a well-oiled machine running in the background of the agency, so that the company owner doesn’t have to hustle for new leads each day, and can focus instead on delivering the best service to his current clients. More and more agents will look for outside services to help them get this right, including agencies and marketing coaches. Example: VMove Estate Agents in Lancaster has a free ebook, The Ultimate Guide to Selling Your Home in Lancaster. It’s hosted on a dedicated landing page, and an opt-in triggers an automated series of emails, carefully crafted to convert a subscriber to a phone conversation. At this point, they can then discuss whether a market appraisal would be a suitable next step. Property marketing has been revolutionised in the last five years, with professional photography and 360’ tours now becoming standard for most premium properties. More and more agents will turn to property marketing to demonstrate differentiation and superior marketing ability to potential clients. Additional services like home staging, twilight photography and drone footage will allow agents to charge a higher commission or to justify an up-front marketing fee. Virtual Reality will become more affordable and enable agents to market properties to buyers out of area or overseas. Example: Cara Ameer, one of Florida’s most successful real estate agents, uses drone video like this one for all her property marketing to really showcase the area and the situation of every home she sells. Vendors love the extra attention and buyers use the videos to shortlist their properties to view, maximising the opportunity to convert them to future vendors. Attention is the new currency of business. Getting and keeping someone’s attention online is trickier than catching a collie when he’s trying to round up sheep (trust me on this). Your content is just a mouse click away from being irrelevant and ignored, but with mobile video accounting for 50% of mobile data usage, and predictions that 74% of Internet traffic is expected to be video in 2017 (source: Invodo), video could be the answer independent sales and letting agents have been looking for. Agency owners will get over their fears of looking foolish on camera, and realise that ‘raw’ footage is often more engaging and entertaining than slick, professionally made corporate videos, boosting brand engagement in a much faster way. Example: Andrew Gunn from Videoseen uses a clever combination of live and recorded video, in raw and professional formats. The result is edgy, entertaining, and very very engaging. Prediction #7: Offline marketing, like canvassing, will be more closely integrated with online marketing. With canvassing and direct mail costs soaring, and response rates dropping to 1 in ten thousand or less, independent agents will start integrating their canvassing campaigns with their online activities. Direct mail postcards directing traffic to specific landing pages with data capture will become the norm, replacing traditional ‘straight-to-phone-call’ leaflets, saving agents money and proving much more effective. Example: Angela Westgarth from the Personal Property Shop in Bishops Stortford uses canvassing leaflets to direct traffic to an online valuation page on her site. The result is many more clicks than she would ever get phone call responses. Prediction #8: Agents’ marketing focus will shift from generating MAs to encouraging subscribers. Once independent agents begin using landing pages and data capture as a central part of their marketing efforts, generating subscribers will become the primary goal of most vendor and landlord campaigns. Agents will then start to use email autoresponder series to engage with prospective clients, and build trust over time. Example: Melissa Shervington from Amity Properties in Birmingham has created a specific landing page to drive traffic to, with the sole aim of generating new subscribers. Prediction #9: Agents will invest more in content marketing, with a clear shift towards predictive content. These days, we are all bombarded with more adverts and messages than ever before. We’re just getting better at ignoring it. Junk mail, tv and newspaper ads, PR, website pop-ups – they are all designed to interrupt us, and therefore, we swat them aside like an annoying fly. Content marketing, however, has the power to resonate with your clients because when done well, it provides answers to questions they are already seeking. Agents will start to get savvy about the content they write, in their blogs, articles and videos. Instead of writing ‘me-me-me’ corporate content, they will research the top keywords and phrases that their prospective vendors and landlords are searching for online. By becoming the source of the highest quality, most relevant and helpful information, clients will see the agent who created it as the go-to expert, and so build trust and liking over time. Example: My site HomeTruths was set up to answer questions from frustrated vendors, and ranks highly for key words and phrases related to selling their home. 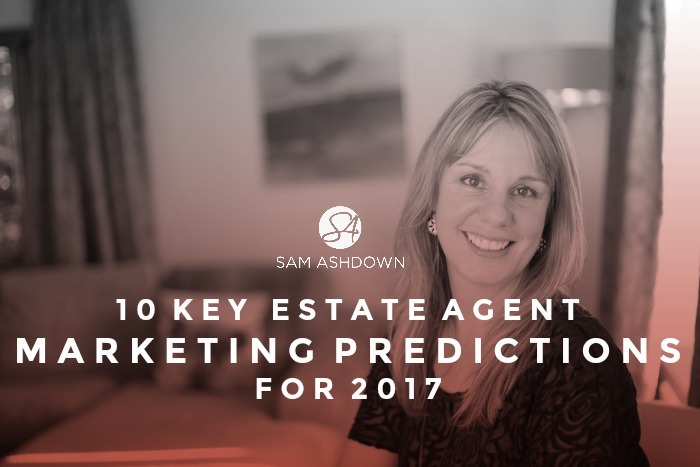 Prediction #10: Agents will direct marketing budgets towards areas that have a direct return on investment. Automated marketing systems – lead-generation funnels and other automated marketing activities will enable agency-owners to leverage their time and spend, and bring in new, quality leads on auto-pilot, so they don’t have to hustle every day for new business. Social media advertising – Facebook advertising, Twitter ads and LinkedIn all represent huge opportunities for the savvy independent agent. Whilst right now these pay-per-click avenues are relatively inexpensive, in time they will become more and more costly, so now is the time to test and implement them in agents’ businesses. High-level coaching – the highest investment a business owner can make in his business, is actually in themselves. The right coach will keep you motivated, focused and totally committed to your goals. Not everyone who has a coach or mentor will become successful, but all successful independent agents have a coach or mentor. If you’d like to talk to me about how together we can make 2017 your absolute best year ever, tell me a bit about yourself and your business below, and let’s see if we can make it happen.